With the extraordinary growth of Christianity in the global south has come the rise of "reverse missions," in which countries in Asia, Africa, and Latin America send missionaries to re-evangelize the West. 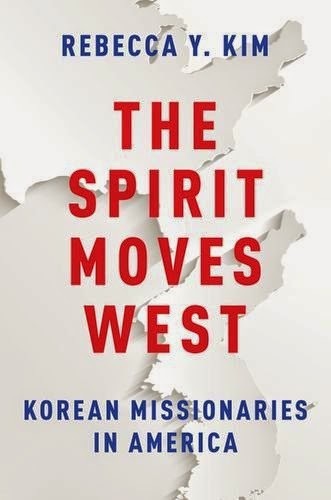 In The Spirit Moves West, Rebecca Kim uses South Korea as a case study of how non-Western missionaries target Americans, particularly white Americans. She draws on four years of interviews, participant observation, and surveys of South Korea's largest non-denominational missionary-sending agency, University Bible Fellowship, in order to provide an inside look at this growing phenomenon. Known as the "Asian Protestant Superpower," South Korea is second only to the United States in the number of missionaries it sends abroad: approximately 22,000 in over 160 countries. Conducting her research both in the US and in South Korea, Kim studies the motivations and methods of these Korean evangelicals who have, since the 1970s, sought to "bring the gospel back" to America. "A powerful tale of a growing movement-missionaries to the United States. Wonderfully researched and written, The Spirit Moves West is engaging, important, and a page-turner. For most readers, what is contained in these pages is stunning." Why things are happening (or not happening) the way they do? Beginning today the UBF daily bread Bible passage comes from the Book of Esther. Immediately this phrase raises a question: Why does God cause things to happen (or not to happen) the way they do? We do know that all are in God's hands, and without him nothing happens, just as it is written: "I form the light and create darkness, I bring prosperity and I create disaster; I the Lord do all these things. " Isaiah 45:7 So you can rest assured that nothing happens or does not happen by accident. In case of Esther this is what the Prophet Jeremiah had already prophesied. In Jeremiah 25 the Lord already talked about the 70 years of exile. All the events described in the book of Esther then had already been in the "plan" of the Lord's mind. And things developed as the Lord planned. What then is the purpose of the Lord causing things to happen the way they happen? What is the Lord trying to accomplish through all these? We find the answer to this question in the prophecy of Jeremiah in regard to the time "span" of the seventy years of exile. In regard to the beginning and ending point of the 70 years of exile, Bible scholars differ in opinions. Some even say, "Wait a minute. The period of exile is not 70; it is more or less 60 years!" But according to Rashi, it begins with the destruction of the temple and ends with the authorization to complete the temple. In view of Nehemiah who rebuked the Jewish leaders of his day "Why do you neglect the House of the Lord? ", I think Rashi is correct. The book of Ezekiel supports the same conclusion, for there Ezekiel describes the Lord's glory departing from the Temple in ten painful steps. Then the temple was reduced to an empty shell. Nebuchadnezar became necessary for the temple to come down, so in the first year of Nebu, Jeremiah began preaching on the seventy year of exile. Eighteen years thereafter the temple came down, thus officially beginning the 70 years of the exile. For the temple to come back up again then all other events had to work together like Mordecai taking care of Esther, Esther becoming the queen (or wife of the Persian Emperor) 14 years prior to the completion of the temple, Hamman becoming rebellious, Mordecai becoming the Prime Minister, Esther producing a son (Darius, also known as Artaxerxes) who in turn had to succeed the throne, only to authorize the completion of the temple, officially ending the completion of the exile. This discussion leaves one more question: What is purpose of the worship? Why is it such a big deal? Or more practically, "What is "in" it for "me"?" Well, the Apostle Paul answered the question already: "all in all" - all in the sense of "all" that are necessary for life which is truly "full". In fact this is the only purpose of His creation, for being God, the Father who sent Jesus, did not need anything for himself. He is all sufficient. Why then did he create the universe and everything in it? The only reason is that He wants to bestow upon his creation the highest good, that is, himself, just as it is written: "God so loved the world that he gave His one and only son that no one shall perish, but through faith in Him all shall have eternal life." "For if you remain silent at this time, relief and deliverance for the Jews will arise from another place, but you and your father's family will perish. And who knows but that you have come to royal position for such a time as this?" Tonight we would like to think about how the Lord leads his servants to fill the right positions at the right times to fulfill the purpose the Lord has in mind. The book of Esther is not a mere melodrama. Jewish tradition celebrates the victories described in this book with a feast called Purim. The word Purim comes from the word pur which means "lot". The word "lot" connotes an accidental luck. But when anyone is in the Lord, nothing happens to him or her accidentally, for God is the God of providence. The same holds true of all the events that are described in the book of Esther. In the Book of Esther we do not find the words "God" or "the Lord". Because of this many question whether or not the turn of events described in the book came from God. But despite the lack of references to God, the Scriptures testify that there is no accident in the Lord. Before sending the Israelites into exile to Babylon, didn't the Lord say through the Prophet Jeremiah, "I know the plans I have for you, the plans to prosper you and not to harm you, plans to give you hope and a future" (Jer 29:31)? Plus, as Daniel is a witness, the most high God is sovereign over the kingdoms of men. By the time Esther became the queen of Persia a lot of Jews were still living in exile. Ezra was one of them. Nehemiah was another. And many were yet to return to Zion. It is important for us to ask, then, such questions as: "What plan or plans did the Lord have?" And, "What are the specifics of the Lord's plan or plans?" It is important for us to ask these questions and find answers to them, for this understanding will help us to gladly participate in the Lord's will. What then are the ways in which the Lord practically fulfills the purpose of his will? The key verse we just read, particularly, the two words "position" and "time" stand out to answer the question. God fulfills his purpose by placing his servants in the right positions at the right times, so that when the need to protect and provide for his children arises, the Lord God will effectively punish those who need to be punished and reward those who need to be rewarded. This is like an experienced football coach assigning the right player to the right position at the right time, so that the team would come out victorious. With this in mind, let us consider the book of Esther in two parts. Part I. So he set a royal crown on her head. 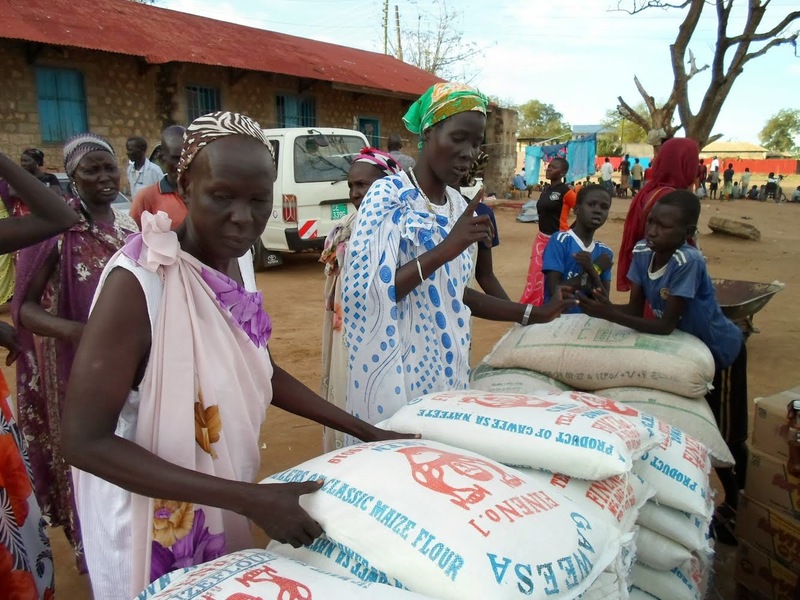 In many places of the Bible we see the Lord God using his own people to protect and provide for his people. In other words, "people" constitute an important part of his plan. We see the Lord God doing the same thing in serving the interests of his children. Practically then, in case of the people of the day of Esther, the Lord made all different positions within the empire, such as the position of the Persian Royalty, which is at the top, or the position of a gatekeeper, which is at the bottom. Then the Lord manned the positions with people fit for them. In the book of Esther, in order to protect and provide for his people, the Lord God came up with two positions: the positions of prime minister and Queen, and he filled them with Mordecai and Esther, respectively. Mordecai, being a Benjamite (the tribe which produced the first king of Israel, Saul), understood the importance of a position, especially the position within a royal society. Being an alien, he did not qualify for a high ranking government position within the empire. In the U.S., if you are not a naturally born citizen, you are not qualified to run for the Presidency. Likewise, if you are a recent immigrant holding an F-1 visa, you cannot apply for a government position, such as the governorship of California. Let us think about Arnold Schwarzenegger, for example. Being an immigrant, he knew full well that unless he beefed up his status, he would not be able to get into the high society of this nation. So he worked hard to build his status and reputation. So from day one of his arrival he worked hard. Knowing that Americans pay attention to looks, he started working on his body. He then began a career as an actor. He soon secured celebrity status. Then he married a Caucasian woman, Maria Shriver, a woman connected to the family of John F. Kennedy. Then, at the right time, he ran for the governorship. In Mordecai's case, since he did not have any "connections" within the high society of the new empire, what did he do? He went to the king's gate. In the book of Esther the expression "king's gate" is repeated ten times. It was by frequenting to the king's gate that Mordecai ended up rising all the way from the rock bottom to the highest position below that of the Emperor. God does not create positions at random. He makes them and fill them all according to the meritorious system he set up from before the creation of the universe. The Apostle Paul explains the same concept, somewhat in a limited way, in 2 Timothy 2:20-21, "In a large house there are articles not only of gold and silver, but also of wood and clay; some are for noble purposes and some for ignoble. If a man cleanses himself from the latter, he will be an instrument for noble purposes, made holy, useful to the Master and prepared to do any good work." In Mordecai's case, he understood the importance of positions within a government. He knew where the power comes from. As he was keenly aware of who the Lord uses, he faithfully commuted to the king's gate. And he did it almost religiously. The Lord found him worthy. So at the right time the Lord caused a few rebels to plot against the king. Mordecai overheard their plans and quickly foiled them. One thing led to another until finally Mordecai rose to the position of power. Such is the case with Esther being chosen as queen. From a human perspective all of the events (Queen Vasti getting deposed, the beauty contest, a Jewish girl being admitted to a Gentile harem only to be chosen as a beauty queen) that led up to her being chosen as queen may seem like a series of accidents. And this Miss Persia was a Jewish girl who in turn was being escorted to marry a Gentile king! What a tragic turn of events! But from God's perspective, his purpose was not to promote a marriage between a Jewish girl and a Gentile king, but to create a position from which the Lord God desired to fulfill his plan to prosper and not to harm his children. Mordecai understood this so he challenged Esther saying, "And who knows but that you have come to royal position for such a time as this?" Here "such a time" refers to the time when the enemies of God's children arose determined to harm them. In fact, Haman breathed out to not just harm them but to completely decimate all the Jews within the empire. The Bible notes that Haman is an Agagite, the descendants of Agag, the king of Amalekites. Traditionally, the Amalekites, being the descendants of Esau, were hostile to the descendants of Jacob. While the Israelites journeyed to the Promised Land they became weary and thirsty by the time they reached the area called Rephidim. Then the Amalekites came out to attack them. Moses asked Joshua to go out and fight them. During the fight Moses held up his hands in prayer to the Lord. As long as Moses' hands of prayer were up, Joshua was winning. But as he lowered the hands of prayer Joshua was losing. So Moses had to stick his hands up to the sky all day long. His hands grew so tired that they took a stone and put it under him and he sat on it. Aaron and Hur held his hands up, one on one side, one on the other, so that his hands remained steady till sunset. Then the LORD said to Moses, "Write this on a scroll as something to be remembered and make sure that Joshua hears it, because I will completely blot out the memory of Amalek from under heaven" (Exodus 17:14). Without exception, by the time the Israelites were about to make a new beginning, Haman, the Agagite, arose to finish off the holy seed. God foresaw this in advance, prepared necessary positions, and manned them with his servants, such as Mordecai and Esther. By positioning his people at the right positions at the right time, the Lord God fulfilled the plans for his children: the plan to prosper them, and not to harm them. In our own generation, the Lord God has the same plans and purposes for his children. In order to fulfill his plans, the plans of prosperity, the Lord God creates and fills positions with servants of his choice, and he does all this according to his time schedule. II. If I perish, I perish. It has been said, "When the purpose is not known, abuse becomes inevitable." A lot of people look for a position of honor. But not all of them go for or roll into a privileged position with the full knowledge of the purpose of the position. Esther was one of them. Of course, due to the King's edict she was forced to participate in the beauty contest. After getting chosen as Miss Persia she became the first lady of the Persian Empire. But at first she did not know the purpose of her position. Yet thanks to Mordecai's challenge, she came to realize why the Lord led her to that position, that is, to save the people of the Lord. After much prayer with fasting, she went for the challenge saying, "If I perish, I perish." Her statement reminds us of the basic truth that each and every position comes with privileges and responsibilities. In her case, the privileges included the privilege to have access to the inner court where the king runs the empire. The use of the privilege came with risks, even the risk of losing her life. But she did not sit on her responsibilities. Queen Esther approached the king without securing prior approval. Then, at God's right time, she pleaded with the king saying: "If I have found favor with you, O king, and if it pleases your majesty, grant me my life--this is my petition. And spare my people--this is my request. For I and my people have been sold for destruction and slaughter and annihilation. If we had merely been sold as male and female slaves, I would have kept quiet, because no such distress would justify disturbing the king...For how can I bear to see disaster fall on my people? How can I bear to see the destruction of my family?" (7:3-4; 8:6). Many people think that serving God's purpose is a losing business. But nothing could be farther from the truth. In fact, the exact opposite is true. In Esther 4:14, Mordecai challenged Esther saying, "[I]f you remain silent at this time, relief and deliverance for the Jews will arise from another place, but you and your father's family will perish. And who knows but that you have come to royal position for such a time as this?" According to Ecclesiastes 3:1, there is a time for everything, and a season for every activity under heaven. Ecclesiastes 3:7b then reads, "a time to be silent and a time to speak." For Esther the time to be silent was over. The time to speak up came. She stood up, and spoke on behalf of her people. Even though the time for God's people to rise and speak has arrived, it is not always easy for them to speak up. In the case of the Apostle Peter, as he stood up and proclaimed that Jesus is the Christ, surprisingly a lot of people repented and believed in the Lord. But as the Holy Spirit started working, the devil also started working. The religious leaders arrested the apostles and put them in jail. But during the night an angel of the Lord opened the doors of the jail and brought them out. "Go, stand in the temple courts," he said, "and tell the people the full message of this new life." Peter obeyed and the gospel kept spreading. On one occasion, as the Apostle Paul preached the gospel in the city of Corinth, many Jews opposed Paul and became abusive. Paul became afraid, so he kept silent. But one night the Lord spoke to Paul in a vision: "Do not be afraid; keep on speaking, do not be silent. For I am with you, and no one is going to attack and harm you, because I have many people in this city." Likewise, although Esther became afraid, she accepted Mordecai's challenge: she disclosed her identity as a Jew and spoke up on behalf of God's people. In the same way we are called to come out of the closet and identify ourselves as Christians. As shepherds and missionaries, we need to stand on Jesus' side and speak for the gospel of Jesus. At first glance it looks like a losing proposition to positively serve God's purpose. But if we forget the purpose of our position as God's servants and just indulge in the privileges for our own self-seeking purposes, we will all perish just as the devil is out there to destroy all that are self-seeking. If, however, we boldly stand up and serve the Lord's purpose, even risking our lives, then, the Lord will bring about relief and deliverance. Otherwise we ourselves will perish along with all who are going to perish. Now, here are a few questions for everyone: What is your position in a church, at work, or at school? Remember that a position is not limited to a job or a location. Holding a certain view point, or taking a stand on one side or another can also be seen as a position. What position or positions are you holding to as a Christian? In a church organization, there can be many positions and these positions come with many different titles. Are you an usher, an elder, a shepherd, a janitor, or a Sunday school teacher? Are you a lay-person? If so, what is your job or career? Why do you think the Lord put you in that position? What are the duties and responsibilities, not just as carnally minded people describe them but as the Lord might have in mind? And what do you do with your time? Mordecai said to Esther, “And who knows but that you have come to royal position for such a time as this?” What does this challenge mean to you? One word: And who knows but that you have come to royal position for such a time as this? 1. Before sending the Israelites to Babylon, through the Prophet Jeremiah the Lord said to them: "When seventy years are completed for Babylon, I will come to you and fulfill my gracious promise to bring you back to this place. For I know the __________ I have for you, plans to __________ you and not to _________ you, _______ to give you _________ and a ________." 2. Mordecai had brought up Esther because ______________________________________. 3. Esther became the Queen of Persia before Ezra and Nehemiah had returned to Jerusalem. 4. Mordecai found out about the plot of the two officers of the king to assassinate the king; he reported the plot to the king. 5. King Xerxes honored Haman, the _________, the _________ of all the Jews. 6. All the royal officials at the king's gate knelt down and paid honor to Haman, for the king had commanded this concerning him. But Mordecai would not kneel down or pay him honor, most likely because: __________________________________________. 7. Mordecai said to Esther, "Who knows but that you have come to royal __________ for such a ________ as this?" Once upon a time a famed shoemaker named Manolo said, "Maintenance is terribly important." Virginia Satir, an American author, seemed to understand its significance, for she said, "We need 4 hugs a day for survival, 8 hugs for maintenance, 12 hugs for growth." In today's daily bread Bible passage, Nehemiah also understood the significance of maintenance. As Kurt Vonnegut Jr., another American author is quoted saying, "Another flaw in the human nature is that everybody wants to build, nobody wants to do maintenance", after completing the work on the house of God and the Jerusalem Wall, people left the work to fall into disrepair. Twelve years after the completion of the work, Nehemiah came back to Jerusalem and saw horrible things going around in the house of God, as is recorded in Nehemiah 13. To bring the Lord's house back to the condition he had first left 12 years before, he took such drastic measures as throwing Tobiah and his stuff out of the house of God. 1. The way of maintaining the house of God, that is, to gather with and stay with Jesus. 2. The significance of maintaining it, that is, the one who does not gather with Jesus is bound to scatter. In talking to those who had spoken ill of Jesus, he said of a man who was cleansed of an impure spirit, not maintaining his inner condition, only to become worse than 7 times than the first. But this is not to say that one can keep himself clean without Jesus, for those who are not with him are against him, just as the religious leaders of Jesus' day like the unbelieving Pharisees and Sadducees falling victim to the devil. Total 49 people came with 21 new students. Among 21, 13 students made covenant with God to receive training during winter vacation of 2015. We are so exciting about it. "And on that day they offered great sacrifices, rejoicing because God had given them great joy. The women and children also rejoiced. The sound of rejoicing in Jerusalem could be heard far away." Thank God for granting us the grace to study the book of Nehemiah. The study of Nehemiah offers us a number of blessings, but most of all we would like to meet Nehemiah and learn of him, particularly his zeal for the Lord and his people. In reading the thirteen chapters of the book we find that the Lord used Nehemiah to accomplish two things: 1) repair work for Jerusalem's walls; and 2) restoration of the Sabbath rest. So let us think about the two important works the Lord fulfilled through Nehemiah. Part I. Repair work for the walls of Jerusalem. The Book of Nehemiah describes in great detail how Nehemiah fasted, prayed, and then eventually completed the repair work for the broken walls of Jerusalem. In punishment for the Israelites' rebellion, the Lord sent the Israelites into Babylon. At that time the Babylonians invaded the land and destroyed the walls of Jerusalem. Throughout the Babylonian captivity and some time afterward, the walls of Jerusalem remained broken. On hearing the condition of the walls, Nehemiah sat down and wept. He mourned and fasted. He prayed to the God of heaven and earth. He then secured the Lord's help to do the repair work. The works he fulfilled were legendary. The questions that arise in our mind then include: "What is the significance of Jerusalem? "; "Why did Nehemiah work so hard to get the walls repaired?" We can find an answer to these questions in the book of Ezra 7:15: "Moreover, you are to take with you the silver and gold that the king and his advisers have freely given to the God of Israel, whose dwelling is in Jerusalem..." The expression "whose dwelling is in Jerusalem," provides us with the answer. Nehemiah worked to secure the fellowship with the Lord. This then leads us to another question: "Did he choose to build the walls of Jerusalem because without doing so the Lord would be 'unwilling' to have fellowship with his children?" Obviously, the answer is no. The Lord is omnipresent. The Lord does not limit himself to any physical location for fellowship with his children. Why then did Nehemiah work so hard on the walls of Jerusalem? Let us open the Bible and read chapter 4 of Nehemiah responsively. In this chapter verse 14b stands out for our attention: "Don't be afraid of them. Remember the Lord, who is great and awesome, and fight for your brothers, your sons and your daughters, your wives and your homes." The expression, "fight for your brothers, your sons and your daughters, your wives, and your homes," especially the word "homes" shows us the cause and therefore the reason why Nehemiah charged people to work on the walls of Jerusalem. 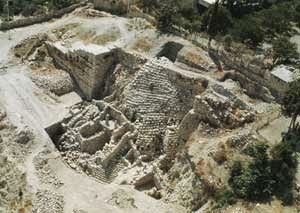 Nehemiah worked to build a spiritual home for his people, the home where the great and awesome God is their Father! It has been said, "There is no place like home." And a home is a home where there is a close fellowship with the Lord among those who love the Lord and put absolute trust in the Lord. We can see the same concept in many places of the Bible. When Jesus came he too exhorted his disciples to join with him to make a spiritual home together, for in John 14:23, Jesus said, "If anyone loves me, he will obey my teaching. My Father will love him, and we will come to him and make our home with him." What Nehemiah endeavored to do to repair Jerusalem's walls is no different than what Jesus prayed his disciples to do with him. Nehemiah's efforts to repair the walls of Jerusalem are consistent with the efforts we, the New Testament believers ought to make to build up godly families in the Lord. We can find the same vision revealed throughout the Scriptures. In the book of Hebrews 12:22-24, for example, it is written: "But you have come to Mount Zion, to the heavenly Jerusalem, the city of the living God. You have come to thousands upon thousands of angels in joyful assembly, to the church of the firstborn, whose names are written in heaven. You have come to God, the judge of all men, to the spirits of righteous men made perfect, to Jesus the mediator of a new covenant, and to the sprinkled blood that speaks a better word than the blood of Abel." It is interesting to note that Hebrews 12:24 ends with the first martyr "Abel," for it reminds us of how family relationships got broken amongst the members of the first family. When Eve gave birth to Cain, the first son, how happy must she have been? But Cain turned out to be the first murderer. And he murdered his brother in cold blood. How tragic! What a horrible turn of events! (1) Revelation 3:12: "Him who overcomes I will make a pillar in the temple of my God. Never again will he leave it. I will write on him the name of my God and the name of the city of my God, the new Jerusalem, which is coming down out of heaven from my God; and I will also write on him my new name." (2) Revelation 21:2: "I saw the Holy City, the new Jerusalem, coming down out of heaven from God, prepared as a bride beautifully dressed for her husband." Let us step back for a moment and see what Nehemiah fought for. First, Ezra describes Jerusalem as God's dwelling place. Then Nehemiah calls it a home for the returnees. Jesus calls it a home for the believers. The Apostle Peter calls it a "spiritual" house. The author of the book of Hebrews calls it the City of the Living God. The Apostle John calls it “a honey moon sweet” so to speak which is prepared as a bride beautifully dressed for her husband. Essentially then Jerusalem represents a congregation of people gathered in a location. It can be called by different names such as a home, a house, or a city. And if it is a city it is a place for the citizens. Now let us think about the practical aspects of the work Nehemiah did. "[F]ight for your brothers, your sons and your daughters, your wives and your homes." Here the word "fight" screams out and draws our attention to the existence of enemies. In Nehemiah's case enemies included the people opposing him - Sanballat, Tobiah, the Arabs, the Ammonites and the men of Ashdod (4:7). Now let us think about the work itself: the construction of the “walls”. What is the significance of the walls? We can understand its significance when we think about its function. Functionally, the walls represent a prepared environment in which God’s children can worship God safely. No wonder that the enemies of God worked so hard to disrupt the work. Now let us think about the enemies and then the means with which to fight against them. (2) The means to fight against the enemies: In Nehemiah 4:20, Nehemiah says, “Our God will fight for us.” So the means is to have absolute faith in God, for this faith in God will drive out fear of enemies. It will keep our hearts to fight the battle bravely. We find the same exhortation in what the Apostle John says in his epistle to the seven churches of his day: “He who overcomes will inherit all this, and I will be his God and he will be my son. But the cowardly, the unbelieving, the vile, the murderers, the sexually immoral, those who practice magic arts, the idolaters and all liars" (Rev 21:78). Interestingly, the first on the list here is the cowardly and then the unbelieving. These two categories of people have one thing in common: doubt. They doubt God, especially God's love and power. God is perfect in his love and power. But any hint of doubt can cause man to fall victim to idol worship. By the same token absolute faith in Jesus Christ, the Lord and Savior, can effectively purge the citizens of the city of God of all evils. Faith in the Lord then insulates its citizens from all the evils raging outside. So the means to fight the Lord's battle is faith in the Lord. Speaking of this truth, the Apostle Paul says, "I have fought the good fight, I have finished the race, I have kept the faith. "Through faith in the Lord, we can work to build the city of God in the hearts of many. By faith in the Lord, may the Lord bless us to engage ourselves in the Lord’s great battle for the great one to one Bible studies. Part II. The restoration of the Sabbath rest. After completing and dedicating the walls to the Lord, Nehemiah worked to reinstate the Sabbath rest. Let us all read Nehemiah 13:13-22. Nehemiah's emphasis on the Sabbath law raises a question: Why did Nehemiah conduct the reform on keeping the Sabbath law with such holy fear of the Lord? Remember what Nehemiah said about those who had violated the Sabbath law in Nehemiah 13:17-18, "What is this wicked thing you are doing--desecrating the Sabbath day? Didn't your forefathers do the same things, so that our God brought all this calamity upon us and upon this city? Now you are stirring up more wrath against Israel by desecrating the Sabbath." His rebuke indicates that he became almost paranoid on seeing people violating the Lord’s command to keep the Sabbath day holy. What is the significance of the Sabbath law? We can find the answer to this question in Deuteronomy 5:15, where the Lord God explains: "Remember that you were slaves in Egypt and that the LORD your God brought you out of there with a mighty hand and an outstretched arm. Therefore the LORD your God has commanded you to observe the Sabbath day." The reason is to help the Israelites celebrate the freedom from slavery in Egypt. Egypt is symbolic of the world where sin (of idol worship) is raging. Characteristically, slavery is the slavery to the world where people chase after created things, rather than seek and worship the Creator. Freedom is getting liberated from working for created things to serving fully the God of all creation. The point of the Sabbath law then is to "fully" secure the worship of and fellowship with the Lord without any distractions. It is to help the believers celebrate the freedom of worship. For believers in the New Testament era, each and every day constitutes the Sabbath Day. Jesus explained this concept when he said, "So the Son of Man is Lord even of the Sabbath" (Mark 2:28). In Colossians 2:16-17, the Apostle Paul says that the Sabbath law enforced during the Old Testament period was merely a shadow of the reality of the things that were to come, and the reality is found in Jesus Christ. So Nehemiah who worked hard to reinstate the law of Sabbath inspires us to celebrate the freedom found in Jesus Christ, for as Galatians 5:1 says, "It is for freedom that Christ has set us free. Stand firm, then, and do not let yourselves be burdened again by a yoke of slavery." The fruit of the freedom in Jesus is "rest" from work. In Hebrews 4:1, the author of Hebrews expresses this concept saying, "Therefore, since the promise of entering his rest still stands, let us be careful that none of you be found to have fallen short of it." Here "his" rest refers to God's rest, and man entering into God's rest denotes the state of the perfected redemption to come, where man (in a resurrected body) is going to enjoy full fellowship with the Lord God without any hindrance. The source of joy a redeemed man derives in God’s presence is the glory of the Lord, not food or drink, or from what is materialistic or humanistic, but purely of the Lord. When this happens, the release from the burdens will be so complete that even the word "work" and all the burdens associated with it will all be forgotten. Speaking of the inexpressibly glorious nature of redemption, the Apostle Paul says in 2 Corinthians 4:17, "[O]ur light and momentary troubles are achieving for us an eternal glory that far outweighs them all." In conclusion, let us read Nehemiah 12:43 again. "And on that day they offered great sacrifices, rejoicing because God had given them great joy. The women and children also rejoiced. The sound of rejoicing in Jerusalem could be heard far away." Along with Ezra, Nehemiah led great reforms among the returnees. His reforms had two clear points: restoration of Jerusalem and restoration of the Sabbath. The point of Jerusalem [i.e., the dedication of its walls to the Lord] goes to the building of the fellowship with the Lord. The point of the Sabbath lies in the celebration of freedom. The two points of reform serve one purpose, but the first point serves the second point. And the point of the second point points to the ultimate bliss God desires to bless his children with. No wonder that when Nehemiah secured these two points of reforms people, especially women and children, were so glad that the sound of rejoicing in Jerusalem could be heard far away. When Nehemiah had rebuilt the wall [of Jerusalem], not a _____ was left in it. The wall [of Jerusalem] was completed in ________ days. After the completion of the wall, on the first day of the seventh month, ______ the priest brought the Law before the assembly and all the people listened _________ to the Book of the Law. After the Bible study the Israelites entered into a _______ agreement, putting it in writing, with their leaders affixing their ______ to it. All Judah brought the ________ of grain, new wine and oil into the storerooms. 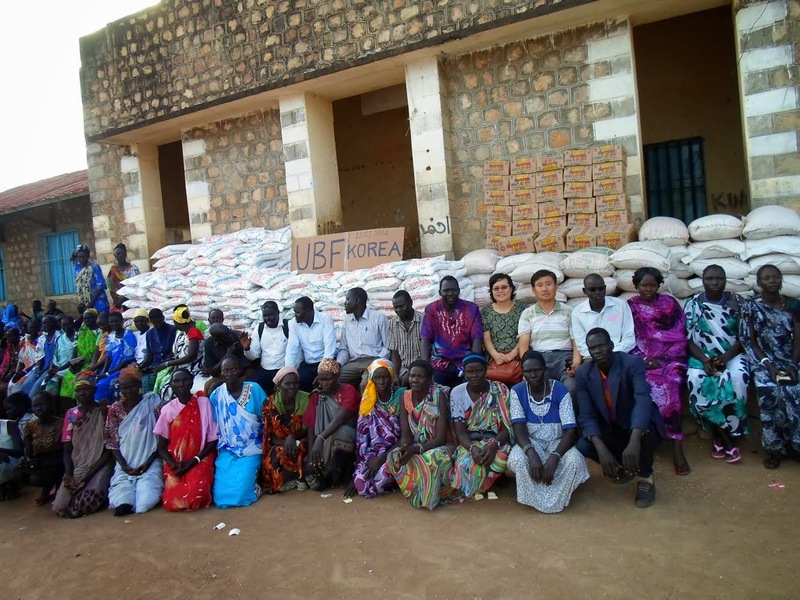 Korean UBF donated a fund to support people of S. Sudan. 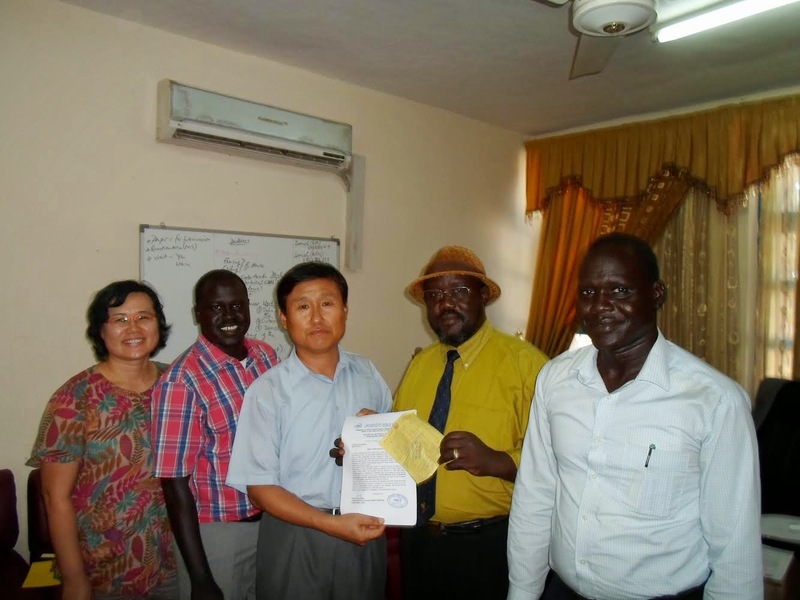 Andrew Kim of Egypt worked with Dr. Oyo Moses of S. Sudan, and on Oct. 14 they met the President of the Juba University, delivered $9,000 (USD) as a free grant for Juba University Students. 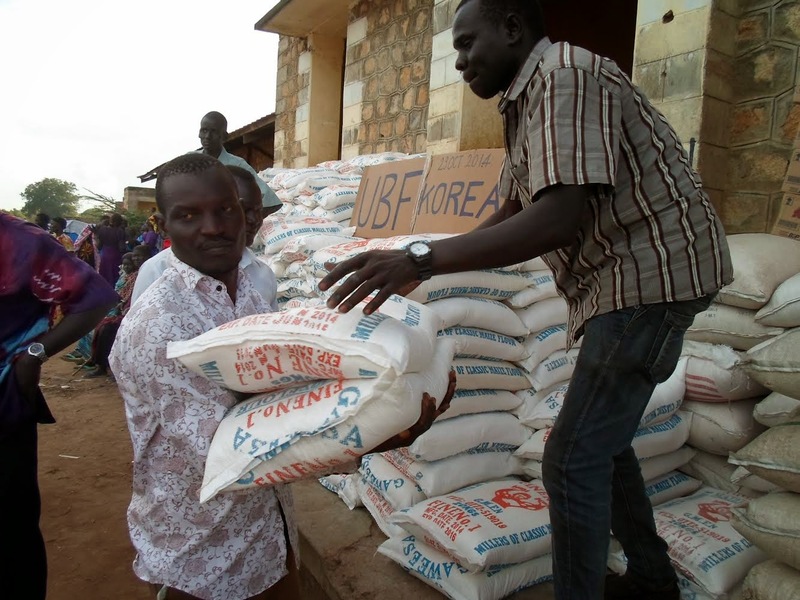 This enabled 53 students to pay for their yearly tuition. 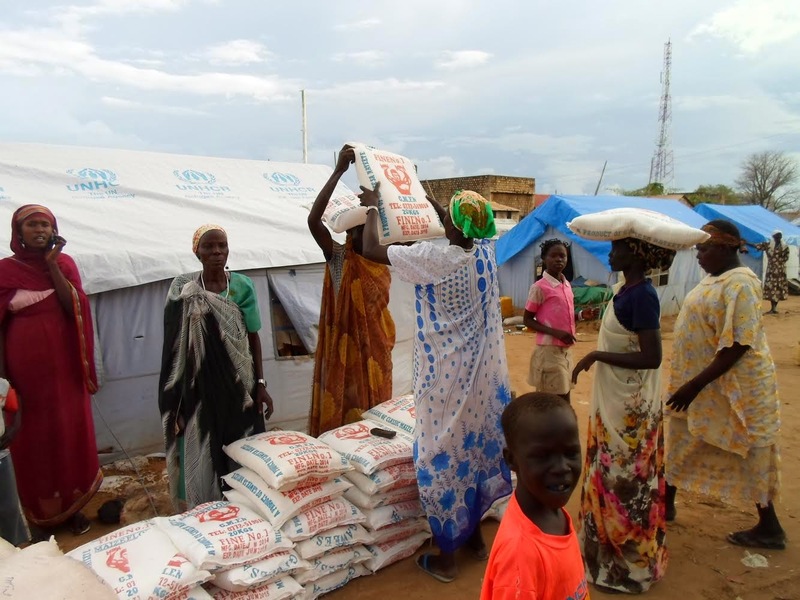 On Oct 20 they visited the refugee camp in Juba, S. Sudan, distributed 402 sacks of flour, 60 bags of lentil, and 408 litters of cooking oil. 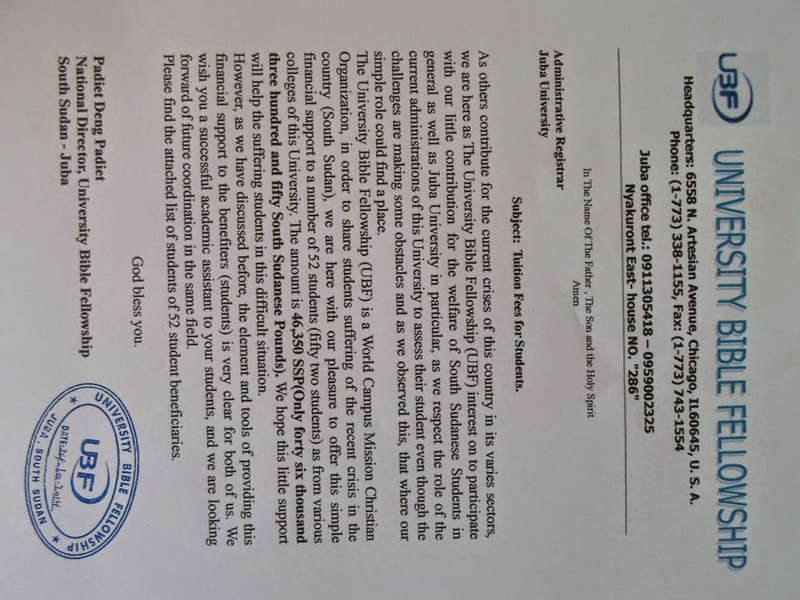 Below are some pictures and Andrew's report to Korean UBF. 주님의 은혜가운데에서 문안 여쭙니다. 남수단 구제헌금 사용결과를 아래와 같이 보고드립니다. 10월14일 한국본부에서 지원해 준 2,000만원을 카이로에 사는 현지 교민을 통해 18,727 달러로 환전, 지급받았습니다. 저와 저의 동역자 김소원 선교사 항공티켓과 입국비자비를 제외한 17,281 달러를 지참하고 10월18일 남수단 쥬바에 입국했습니다. 10월20일에 쥬바대학교 총장을 면담하고 장학금 전달방법을 의논했습니다. 그 다음날, 학교에서 지정해 준 은행에 장학금으로 9,000달러(46,350 남수단파운드)를 예치했습니다. 쥬바대학교는 남수단 제일의 대학교이며, 만명의 학생들이 재학중입니다. 그러나 기숙사를 운영할 수 없을 정도로 경제적인 어려움이 있고, 많은 학생들도 도움을 요청하고 있다고 합니다. 우리가 전달한 장학금으로53명의 어려운 대학생들에게 1년치 학비를 지원할 수 있게 되었습니다. 지원대상 53명의 학생들은 학교당국에서 받은 명단중에 오요모세스 목자가 면담해서 최종 결정한 학생들입니다. 이 캠퍼스에서 우리 형제 자매들이 매주 성경공부 모임을 하고 있습니다. 총장은 감사표시와 함께 우리가 요청도 안했는데 우리 모임장소를 캠퍼스내에 제공하겠다고 먼저 제안했습니다. 우리의 도움이 실질적으로 그들에게 도움이 되고 격려가 되어 감사합니다. 10월24일에 쥬바시내에 있는 난민촌을 방문하여 밀가루 402포태 8,040 kg, 랜틀 60포대 3,000 kg, 식용유 408 리터를 전달했습니다. 이 난민촌은 작년 10월부터 내전지역으로부터 난민들이 모여들어 현재 800 가구이상이 거주하고 있다고 합니다. 3개 종족으로 구성되어 있는데, 종족대표들이 식량을 종족별로 나누고 또 그 종족안에 소규모 그룹별로 질서정연하게 배분했습니다. 비록 우리가 전달한 식량이 전부에게 돌아가기에는 부족하지만, 전달하는 우리나 받는 그들 모두 기뻐하고 감사해 하는 것을 보고 하나님께 감사할 수 있었습니다. 무엇보다 그들이 하나님께 감사하는 것을 보고 감명을 받았습니다. 한국본부에서의 지원과 사랑이 우리 리이더들 포함해서 그들에게 격려가 되고 도움이 되는 것에 하나님께 감사를 드립니다. 저는 10월31일부터 11월2일간 있는 수양회를 참석한 후 11월3일에 카이로로 돌아갈 예정입니다. 주님께서 목자님께 늘 말씀과 성령 충만하시길 기도합니다.